A Happy, Wondrous, and Healthy Holiday Season! Wearable Patches: Order sufficient supplies to last till mid January. Biofeedback: Schedule now for limited December and January sessions. Gift Givers: Order soon to allow plenty of time for delivery before the holidays. Actually RELAX and ENJOY the season! Beat holiday stress with potent 3-patch combination. Effective, natural drug-free solution to help maintain your sanity. Look ravishing & suave in your festive holiday outfits! There’s still plenty of time to take off unwanted pounds and inches BEFORE the holidays! Easy natural way to limit and control unwanted weight & inches from creeping on DURING the holidays. Give gifts of health to those special people on your list. There’s a perfect application for everyone! Turn On Natural Ability To Heal! 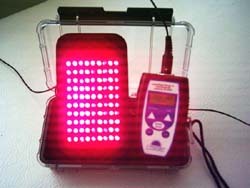 Click here to read more about Lumen Photon Therapy from respected medical doctor, Sherry Rogers MD. Again, please accept our wishes for Peace and Health during the Holidays!